Green Kid Crafts Deal – 60% Off Your First Box! Green Kid Crafts Deal – First Month FREE! Last Day! 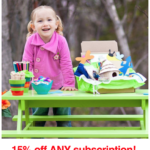 Green Kid Crafts Sale – Save $25 Off Pre-Paid Subscriptions!